Is there any way to sort the app drawer alphabetically? Hi everyone. With the recent purchase of my S6 edge I'm new to android and have some quick questions. First, is there any way to sort the app drawer alphabetically? When I click on edit the only option I get is to disable or uninstall apps. Secondly, I recently read a tip somewhere that said to reboot into safe mode and then restart to normal. This would help improve battery life. Not sure if this is the cause but I did see an improvement after that. Anyway, I also noticed that apps in the app drawer are now scattered across 6 screens with some containing only 1 or 2 icons. I cannot move these to other screens. Is this normal behavior? Am I stuck with 3 screens with 1 or 2 icons on each? I don't recall if this was the case before I did the boot to safe mode. Open your app drawer. Open the menu, tap "view as" and the tap "Alphabetical order". 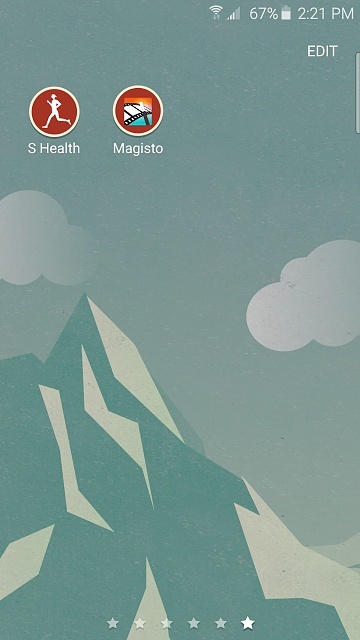 This is how it is on my S4 running Lollipop, I would imagine that the S6 would be very similar. That's the thing. The only option I have in the app drawer is edit. Unless there's a menu button that I'm not seeing. The menu is the 3 dots. Just to the left of Edit you should see A-Z. That will sort them alphabetically, but if you add more apps, you have to do it again. Guys, sorry about my ignorance. Here's a screenshot of what I'm seeing; no menu, no A-Z sorting option. I'm sure I'm doing something wrong so thanks for your patience! Yeah, read somewhere after posting that this is a bug on some carriers. I'm with Rogers. I tried it again and all it did was to rearrange my home screen so I had to set up all my icons again. The app drawer is still the same with icons scattered around and no way to consolidate them on fewer screens. The screen shot i posted above is what I have. The screen before it has one app and the one after is half empty. Of course I did restart in normal mode. For what it's worth, my battery life has improved significantly in the two weeks I've had my phone. I couldn't get through the day at first but now I'm easily getting 20+ hours which is fine by me. Now I'm not saying the safe mode boot did that but it is an odd coincidence. It must be a carrier specific thing. My tmo s6 edge has A-z there as well as other major carriers I believe. Rogers doesnt for some reason. Might need to go into a Rogers store and see if S6 on display has same screen as you in the app drawer or if its only your device. Might need to go into a Rogers store and see if S6 on display has same screen as you in the app drawer or if its only your device. Good idea...I'll check it out and post an update. Hold your finger on the icons you want go move and then guide them over to the screen you want. Don't use TouchWiz? I'm using google now launcher and it automatically alphabetize is the app tray. Forget touchwiz. Install another launcher. Crazy, but that's the only way. I've been using Go Launcher for many years, since 2.3.6, and no matter which android I have on my device, it always looks the same. But there are hundreds of other launchers. This is most likely carrier specific, in the UK my A-Z was missing but now that 5.1 has come out it has appeared on my phone. Maybe you will get it when you get the new update. Is there an app that actually sorts the app drawer, in the absence of Touchwiz removing this much wanted functionality? Same issue on my Galaxy s5 there's no app drawer menu that will let me sort the apps (including the wrench at the bottom) UNTIL i accidentally swiped up on the far right and it brought up the menu (same as 3-dot was)! I hope that works for you too! Open the app drawer, go to the last page where there's some open space and swipe up. Granted, I'm using Go! Launcher, so it may only be an option for that. Hope it helps!! Why can't I access in app purchases on one of my games?